Perfect for the Christmas holidays, this designer wine glass says it all. 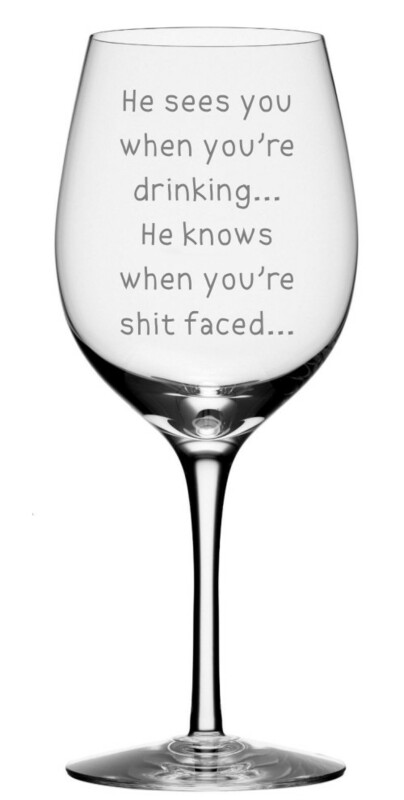 "He sees you when you're drinking" Wine Glass makes a perfect gift for the wine lover in your circle of friends. 904 Custom offers an array of stylish gifts for wine drinkers, featuring this "He sees you when you're drinking" wine glass. Give this to your favorite wine lover as a gift or get it for yourself and make a statement with every sip. Whether you are wrapping it up for a friend or treating yourself, this "He sees you when you're drinking" glass is sure to be a hit at your next wine party or gathering!